A moment of perfect timing, agility and sheer audacity marked the return of Wayne Rooney's instinct for goal as he propelled Manchester United nearer to the Premier League title on Saturday. 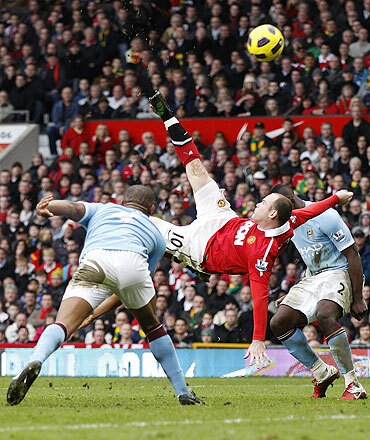 He jumped, twisted his body and stretched his right leg to unleash an overhead volley that he described as the greatest goal he had ever scored and one that secured a 2-1 win over Manchester City in a fascinating derby at Old Trafford. "I saw it come in the box and just thought why not?" said Rooney. "Thankfully it went in the top corner. "Nine times out of 10 they go over the crossbar or wide," he told Sky Sports. "I didn't have time to think about what I wanted to do. I've not scored an overhead since school." He stood arms stretched out and looking skywards as he let the chants of "Roon-ey, Roon-ey" wash over him as United fans forgot about his often troubled season and gave him the sort of reception he used to get when he could do no wrong. Injury, off-field problems and the saga over his contract have marred a season in which he has scored only six goals and his confidence had seemed to have been knocked after 34 goals last term. Two goals against Aston Villa earlier this month showed the tide was turning and any doubts over his self-belief were banished with the type of wonder strike most players would only dare to experiment with on the training ground. 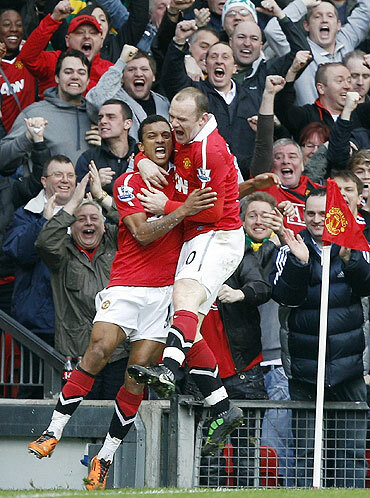 "I've not seen anything like it that's for sure," said United manager Alex Ferguson. "Stunning, unbelievable." Even City boss Roberto Mancini could only watch in awe. "We should clap," the Italian told a news conference. "Incredible, a fantastic goal." It is probably too soon to talk about the complete Rooney of old returning as his performance in much of the rest of the match was second-best to lively winger Nani, who had the better chances and also scored the first goal. "I was not that pleased with my overall performance today but the lads said just stay up there in the box and you'll get a chance," said Rooney. "Thankfully I put it away." It is not too soon, though, to say Rooney is finding his goals at just the right time in the season as United seek a record 19th league title. While the England striker has been struggling for form, Dimitar Berbatov has taken over the goalscoring mantle and a few eyebrows were raised when the league's top scorer was left on the bench on Saturday. The tactic paid off ultimately with the victory but in fact United looked more comfortable going forward when Berbatov was introduced midway through the second half as a cluttered midfield suddenly had more room to manoeuvre. Ferguson said the challenge now was for his strikers to find the net more away from home since at Old Trafford they have dropped only two points this season. 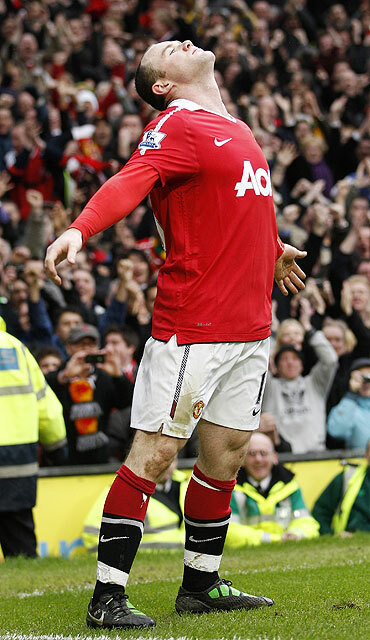 "What I need from Wayne and Berbatov is performances away from home. "They have not been as good as they have been at home and that's a quandary because the ability those two have they should be dictating games away from home for us because when they do they will make a hell of a difference." The result gave United 57 points from 26 games with Arsenal on 53 from 26. City's title prospects are receding as they are on 49 having played a game more. Tottenham Hotspur moved above Chelsea into fourth spot with 47 points from 26 after Croatia midfielder Niko Kranjcar struck the winner for the second successive week in a 2-1 win at Sunderland. Chelsea face Fulham on Monday. Liverpool's surge under Kenny Dalglish slowed as they were held 1-1 by Wigan Athletic at Anfield to slip eight points off the top four in sixth spot. At the other end of the table West Ham United recovered from 3-0 down to draw 3-3 at West Bromwich Albion, Blackpool drew 1-1 with Aston Villa and Birmingham City scored late to earn a vital 1-0 win at home to Stoke City. Blackburn Rovers and Newcastle United ended goalless. Arsenal made sure they did not push the self-destruct button on Saturday as they cruised past Wolverhampton Wanderers 2-0 to bolster Arsene Wenger's belief that his side can overhaul Manchester United in the title race. 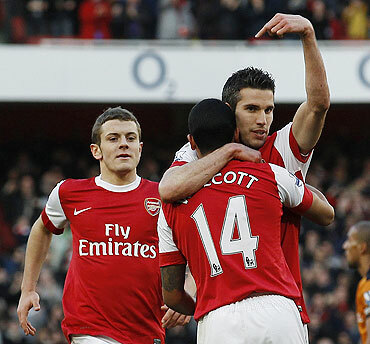 Robin van Persie scored twice as second-placed Arsenal kept United's lead at four points with 12 games left to play. As victories go it was as stress-free as last week's bizarre collapse at Newcastle United was harrowing. "We are in a Premier League race, we believe we can do it, we have the hunger, and we can focus on every single competition and that is important," Wenger, whose team threw away a 4-0 lead last week to draw 4-4, told the club website (www.arsenal.com). With Barcelona looming large in Wednesday's Champions League first knockout round tie Wenger was delighted his side had maintained their focus on the domestic title race. 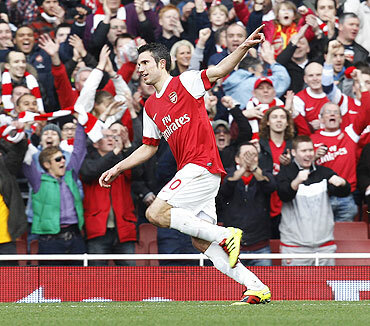 "We were defensively solid and that was important after the four goals we conceded," Wenger said. "We create many chances, the only regret is that maybe we didn't score enough goals. "We had to stay focused. For us it is important because on Wednesday we play certainly at the moment the best team in the world. It is important to go into the game with psychological confidence and as well in a strong position in the league. "For me it was important we showed the focus today and (the players) did not have Barcelona in their mind." While Dutch striker Van Persie grabbed the headlines with his timely double, Wenger again praised the contribution of young midfielder Jack Wilshere who made his first start for England on Wednesday against Denmark. "I think he had a very good game. He defends well, attacks well, creates chances, had assists," Wenger said, adding that all Wilshere needs now is to add to his solitary league goal this season. "I believe he will soon score, he looks very close. "He has a hesitation sometimes to finish himself and chooses at the moment to give the ball, but I think when he will be a bit more confident he will score goals. He has not scored yet but Cesc (Fabregas) was for a while like that." Wenger said he was confident that Van Persie, who has scored eight goals in the last six games, would be fit to face Barcelona despite going off with a knee injury.